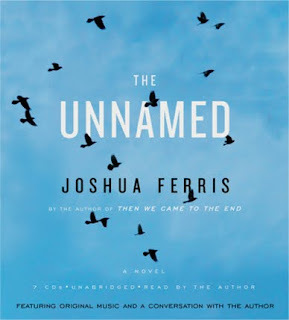 Joshua Ferris’ debut novel Then We Came to the End was both heralded by critics and a New York Times bestseller, and marked the arrival of a startlingly talented young writer. With THE UNNAMED, Ferris imagines the collision between one man’s free will and the forces of nature that are bigger than any of us. Tim Farnsworth walks. He walks out of meetings and out of bed. He walks in sweltering heat and numbing cold. He will walk without stopping until he falls asleep, wherever he is. This curious affliction has baffled medical experts around the globe–and come perilously close to ruining what should be a happy life. Tim has a loving family, a successful law career and a beautiful suburban home, all of which he maintains spectacularly well until his feet start moving again. What drives a man to stay in a marriage, in a job? What forces him away? Is love or conscience enough to overcome the darker, stronger urges of the natural world? THE UNNAMED is a deeply felt, luminous novel about modern life, ancient yearnings, and the power of human understanding. I will begin by saying I have a love/hate relationship with audio books! In some capacities, if you are driving in your car or working out, then listening to books would be great. However, if you have any type of attention span problem, then you will hate audio books for that reason! When reading books, you can go back to the spot where you lost track and read it again. With audio books, it is hard to do that, so if you have problems with that, you might want to borrow a book from the library before you go out and purchase it. I will also add though, the way they have the chapters makes it easy to go to where you need in the audio books, so this is an easy task. It is also nice in a way to NOT have to read something, and be able to have someone else do it for a change! The Unnamed takes you through all types of feelings, but you definitely feel compassion for his wife! You never know what might happen in life, and this novel definitely helps you to understand that. It also helps you to see that your family should be the most important thing, and work should as well, but there is a fine line between work and too much work. This book will help you to see that you need to find your own fine line. The characters will keep you going from the first down to the last CD. This audio book was received by Hachette Audio, and is my own honest opinion.